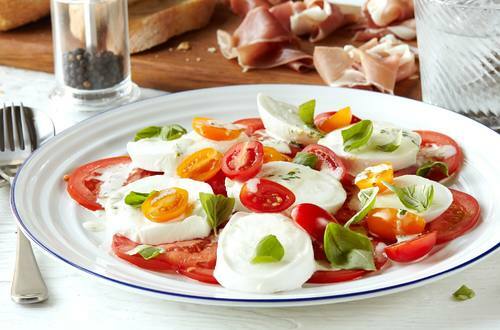 Vibrant tomato salad with mozzarella. Especially delicious when tomatoes are at their peak. The flavors are brought together with creamy Hellmann's® or Best Foods® Real Mayonnaise. 1 Process Hellmann's® or Best Foods® Real Mayonnaise, lemon peel, lemon juice, olive oil and 5 basil leaves in blender at high speed until smooth; set aside. 2 Arrange plum tomatoes and mozzarella on serving plate. Top with cherry tomatoes, drizzle with Mayonnaise dressing and garnish with remaining basil leaves, torn. *Substitution:  Use 2 beefsteak tomatoes, sliced.